In the early-1960s, it was evident that a new Presbyterian congregation was needed on the growing edge of Speedway and the Northwest side of Indianapolis. Five acres of land were purchased at the corner of 30th Street and High School Road in January 1961, and Laurence Sunkel, associate minister at Irvington Presbyterian Church, was called as the organizing pastor in September 1961. St. Andrew Presbyterian Church gave a list of 30 families who lived in this area and who wished to be part of this new church development. The first worship service was held at St. John’s Episcopal Church (3 blocks away) on September 17, 1961. Initially known as the “Speedway Presbyterian Mission,” the congregation soon chose the name “John Knox” to remember its heritage and roots in the Reformed faith. The organizational service was held on March 4, 1962, at St. Andrew Presbyterian Church, where 121 charter members were welcomed. In John Knox’s 50 years of ministry, there have been four pastors who have served the congregation. Rev. Larry Sunkel served from 1962-1971. Then Dr. Roger Dean was called as pastor from 1971-2000, serving the congregation for nearly 30 years. During that time, Rev. Mark Merrill was called as associate pastor, and served in that capacity from 1977-2002. Rev. Frank Mansell was called as pastor in 2003, and Lisa Crismore was called as Commissioned Lay Pastor in 2004. During our 50 years of ministry on the west side of Indianapolis, John Knox has hosted and engaged in a number of vital ministries. The Speedway Co-Operative Preschool has served the community for over 40 years. The Presbyterian Women’s Organization has been very active, holding annual holiday bazaars and garage sales. Music has always been an important aspect of the congregation’s life, and has included installing a pipe organ in the early-1980s, then having that organ restored in the early-2000s. That love of music has also translated into a dedicated lay-team beginning a contemporary worship service 11 years ago, with members offering the music, technology, and creative leadership each week. In recent years, John Knox has opened its doors to the community, where over 15 different groups meet to find comfort, guidance, and support. This has included the Hispanic community, who come to learn English, and the Neighborhood Christian Legal Clinic, where free legal help is provided. It also has begun new ventures in mission, including a bi-lingual Vacation Bible School every August, and increased partnership with community service agencies and local schools. 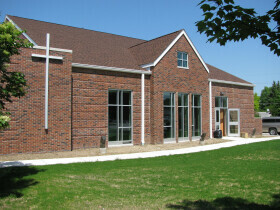 In 2010, John Knox completed and dedicated its new sanctuary after a three year process. In marking this milestone, our congregation has made a long-term commitment to share the light of Christ in this place. We are grateful for our past 50 years of ministry, and we look forward with anticipation for what God has in store for us in the years ahead! In John Knox’s 50 years of ministry, there have been four pastors who have served the congregation. Rev. Frank Mansell was called as pastor in 2003, and Lisa Crismore was called as Commissioned Lay Pastor in 2004.